Players running around an empty field in spandex is an imperfect evaluation. But I don’t trust my eyes – and quite frankly, I don’t trust the eyes of NFL scouts either. “Pick the right players” is not a real draft strategy because prospect evaluation in a large sample has repeatedly been proven nearly impossible. A real draft strategy is to accumulate as many assets as possible to give you a chance to hit home runs. Getting too high on a player outside of these thresholds can be disastrous. For example, Laquon Treadwell went 23rd overall in 2016 despite a 4.64 forty, 33-inch vertical and 117-inch broad jump. I highlighted his issues ahead of that draft here. 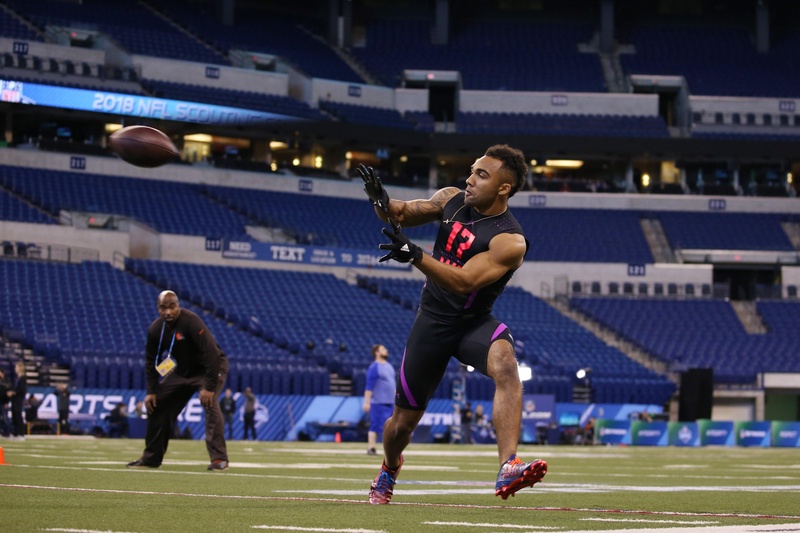 Tyler Boyd went 55th overall despite a shaky 4.58 forty, 34-inch vertical and 119-inch broad. In 2017, the Chargers surprisingly took Mike Williams 7th even though his testing was sub-par as noted here. John Ross went 9th despite weighing in at 188 pounds. Naysayers will point to players who have finished in the top-10 of fantasy scoring despite falling below thresholds. Antonio Brown weighed in at 186 pounds. Jarvis Landry ran a 4.77. DeAndre Hopkins’ broad jump was only 115 inches. Of course, there will be outliers, but the point remains that failing to meet the above thresholds is going against the probability of success. 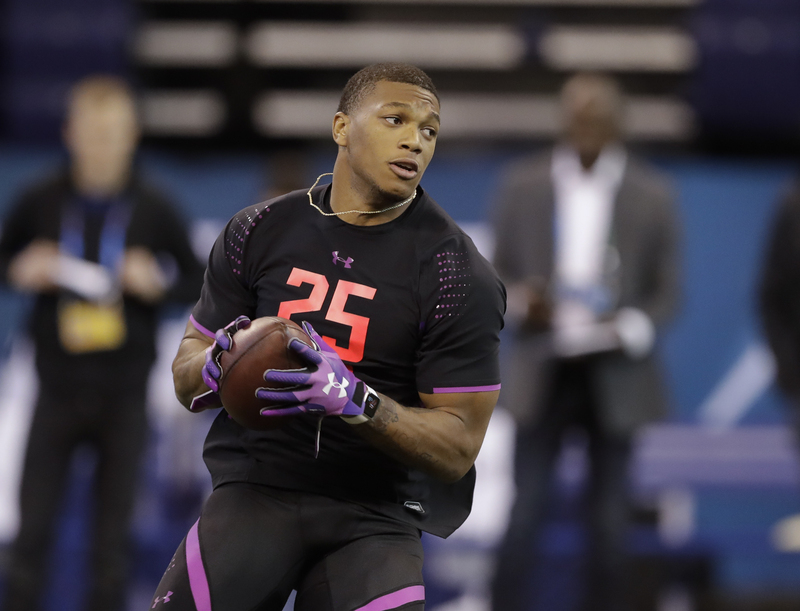 With that in mind, a look at five wideouts projected to go in the first three rounds of this week’s draft. Josh Doctson had the best athletic profile in the 2016 wideout class. Chris Godwin held that honor last year. The honor this year clearly goes to Moore, who crushed all thresholds for elite fantasy wideouts. He clocked a 4.42 at 6’0/210, recorded an elite 39.5-inch vertical and posted a 132-inch broad jump. Only three of the aforementioned 30 top-10 fantasy wideouts went over 132 inches – Antonio Brown, Dez Bryant and Calvin Johnson. Moore also performed on the field despite dealing with shaky quarterback play. He went 80-1,033-8 in 2017 for a 97th percentile college dominator score (via PlayerProfiler.com). Much like Laquon Treadwell before him, Ridley’s athletic profile is extremely concerning. Note that Treadwell only met 1-of-4 thresholds and had a 48th percentile college dominator score. 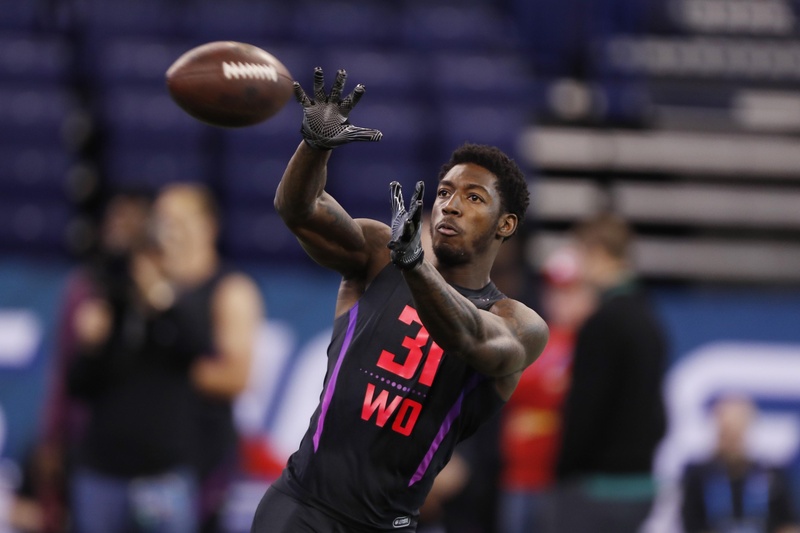 Ridley only met 1-of-4 thresholds and had a 51st percentile college dominator score. 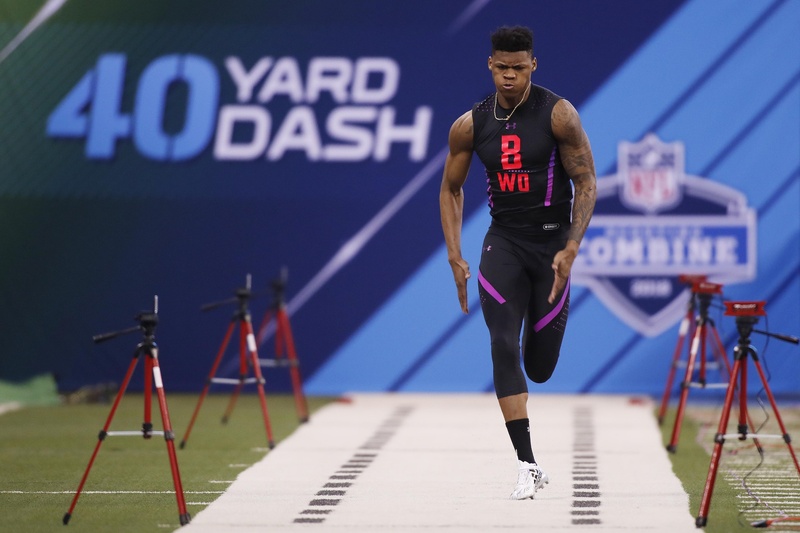 Ridley did run a strong 4.43, but it’s not as impressive considering he weighed in at just 189 pounds. The burst is also troubling as he fell way under thresholds at just 31-inch vertical and 110-inch broad. His SPARQ score is in the 6.8 percentile. On top of all that, Ridley is old for a rookie as he turned 23 back in December. Sutton checks in three inches taller than Moore but not quite as explosive. He ran a 4.54 with a 35.5-inch vertical and 124-inch broad. Still, Sutton is a unique athlete in his own right as he sports a wicked 92.9 percentile SPARQ score and met all four thresholds. (Moore is in the 97.1 SPARQ percentile.) From a strict measurable perspective, Sutton compares closely with recent top-10s such as Michael Thomas and A.J. Green. Kirk failed to meet the broad jump threshold by leaping just 115 inches. He also barely cleared the vertical at 35.5 inches. The lack of burst is a bit concerning for someone just 5-foot-10. Note that plenty of players that height and smaller have posted top-10 fantasy seasons (Tyreek Hill, Doug Baldwin, Brandin Cooks, T.Y. Hilton, Randall Cobb, Antonio Brown). But all other than Cobb met the jumping thresholds. Chark sharply climbed up draft boards as the process moved along. If it weren’t for D.J. Moore, we’d be hearing a lot more about Chark’s freakish athleticism. 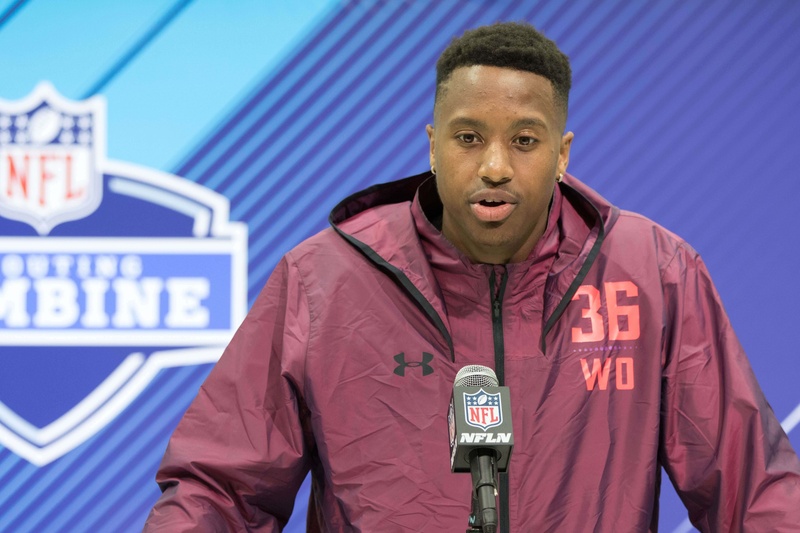 He posted an eye-opening 96.2 percentile SPARQ score by running a 4.34 forty coupled with a 40-inch vertical and 129-inch broad at 6’3/199. We simply don’t see this kind of straight-line speed coupled with this kind of burst. Chark has a lot of work to do on the field as evidenced by his meager 66 career catches at LSU, but his NFL coaches will be getting an athletic specimen to work with.